It was two years ago we were first introduced to the Sony MDR range, headed-up by the self-proclaimed "prestige" MDR-1R headphones. We had to hand it to Sony, though, despite sounding almost pompous they were very impressive over-ears, delivering quality in both the build and sound departments. They were, however, rather pricey. That's where the newer Sony MDR-1A headphones come in: they're smaller, lighter, and at £169 upon launch, more affordable too. They might not assign themselves the "prestige" name, but they are capable of delivering high-resolution audio so whether you listen to YouTube streams, standard MP3s, or like to dabble in 24-bit WAV files, they've got you covered. And they've had our ears covered for the past week, assuming the stand-in position on our ever-rotating headphones roster. Are the MDR-1A the best over-ear headphones to pick on a sensible budget? Given their sensible price point, the MDR-1A over-ears look great. They're all about their large foam-padded earcups, which dominate the design like a Basset hound's ears. Although the metallic exterior couldn't be accused of being "cute" like said pup, it gives the headphones a chiselled and attractive appearance. The soft finish of the earcups is immediately comfortable for long periods of wear, and we've gone for many hours at a time with the MDR-1A temporarily glued to our head. Not literally, mind, that wouldn't be comfortable to get them off. From tube journeys to drown out the on-the-go air hiss and drawl of talk-aloud commuters to extended desk-based listening sessions, these Sony cans always feel comfortable, no hint of pinch or discomfort. The 225g weight feels buoyant on the head too, aided by the plush, squidgy headband at the top. It's not leather, though, which might be a disappointment for some. However, the fairly loose nature of the fit may work as a negative for those with small heads. Although the earcups' positions can be adjusted, it goes from large to larger to largest. Fine for us, with our over-sized heads (and egos) but not necessarily suitable for all. Also included in the box is a simple carry case, along with a 1.5m cable for controlling smartphone playback. All very straightforward stuff rather than a luxe carry case, but it does the job and befits the price point. The earcups can also rotate sideways thanks to an enfolding design that makes transport easier in that carry case. The more subtle angles of this hinge-based rotation are used to best effect when worn: everything sits at the right angle to fully encompass your ear lobes. And with ears fully shrouded the listen is equally full. 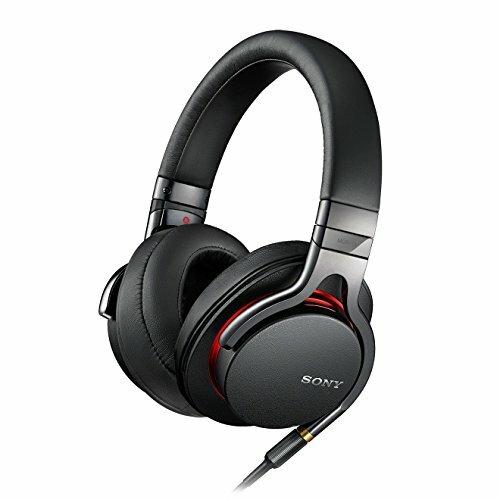 Indeed, the Sony MDR-1A over-ear headphones sound good. Astoundingly good. We've not needed to tinker with equalisers or make any adjustments, and whatever genre of music we've thrown at them has been deftly handled. Vocal ballads, chest-thumping bass anthems, balls-to-the-wall heavy metal, even the ambient sounds of the solar system (yeah, we're like that) - everything has sounded fantastic. No surprise really, given the 40mm drivers are said to be capable of delivering a 3-100,000Hz frequency response, which is way outside of human hearing capability at both the low- and high-end. Psychoacoustics and all, but we need no mental evaluation to beam about how great these headphones sound. Sculpted vents are employed to maximise airflow and a aluminium-coated liquid crystal polymer diaphragm are fancy ways of saying the bass kicks - and through to loud volumes too. Turn things up to 11 and, well, you'll probably end up deaf after not too long. But at least you'll be hearing super-loud, distortion-free audio in the process, eh? Sat at our desks and the large nature of the earcups delivers sound in an almost surround-sound kind of way. The spatial soundscape here feels more immersive, clearer and separated than many competitors. It makes for a great listen with glorious bass without ever being over the top, and there's exceptional clarity in among the mid-level frequencies. Our only complaint circles around that relatively loose fit. We've noticed when out and about that the position of the drivers relative to the ears can slip forward ever so slightly. Not to the point that you feel like the headphones themselves aren't secure, but such minute repositioning can make a difference to sound - and if the drivers aren't central to your ears then the high-end can dip a little. But even when it does the quality still walks it compared it to the competition. We've been testing headphones back-to-back for a number of weeks and have found the Sony MDR-1A to be the most immediately comfortable and gratifying over-ears straight out of the box. From the moment you plug them in and pop them over your ears, everything sounds exceptional whatever your musical genre of choice. Bass response is top drawer, punchy without being over the top, while mid-level and higher frequencies are crisp and clear. The separation of sound gives an all-encompassing stereo listen that's really engaging - more so if you have high-resolution audio files - and although it's not a neutral listen, the Sony MDR-1A add the exact kind of pomp we like our audio to have. For our large noggin the MDR-1A fit is fine, but those with smaller heads might struggle to get the same experience. That's something to keep in mind, as you might not get the same five-star experience, but from our week's worth of listening sessions, and given the sensible price point, we have to say the Sony MDR-1A is a top class choice. The term "prestige" isn't used in the MDR-1A's product title this time around, but based on the audio experience we've had it might as well have been. These are exceptional headphones for the price.